BACKGROUND : Early detection and multimodality therapy has resulted in an overall improvement of survival among breast cancer patients. Despite a significant shift in the treatment approach from radical mastectomy to breast conservation a significant number of patients develop lymphedema. This study was conducted to evaluate the prevalence and risk factors for development of lymphedema. SETTINGS AND DESIGN : Retrospective analysis for prevalence of lymphedema in a tertiary care regional cancer centre. MATERIAL AND METHODS : Three hundred treated breast cancer patients with a minimum follow up of one year were evaluated for the prevalence and risk factors for lymphedema. Lymphedema was assessed using a serial circumferential measurement method. More than 3 cm difference in circumference is considered as clinical significant lymphedema. Univariate and multivariate analysis were performed for evaluating the risk factors by using the Chi square test and Cox logistic regression analysis. RESULTS : The prevalence of clinically significant lymphedema was 33.5 % and 17.2 % had severe lymphedema. The prevalence of lymphedema was 13.4 % in patients treated with surgery only where as the prevalence was 42.4% in patients treated with surgery and radiotherapy. Stage of the disease, body surface area > 1. 5 m2, presence of co-morbid conditions, post operative radiotherapy and anthracycline based chemotherapy were significant risk factors in univariate analysis where as axillary irradiation and presence of co-morbid conditions have emerged as independent risk factors in multivariate analysis (P < 0.001). CONCLUSION : Post treatment lymphedema continues to be a significant problem following breast cancer therapy. Presence of co-morbid conditions and axillary radiation significantly increases the risk of lymphedema. A combination of axillary dissection and axillary radiation should be avoided whenever feasible to avoid lymphedema. Breast cancer continues to be the most frequently occurring cancer in women. With the advent of multimodality treatment and early detection methods, there is an overall improvement in survival. With this transformation of the disease into a chronic condition the focus of attention is recently being directed towards late post treatment sequelae like lymphedema. Complications of varying magnitude occur in up to 8 to 63% of patients following breast cancer treatment.,,, The incidence of upper extremity lymphedema varies from 2% to 40% in women with breast cancer who have been treated with surgery, radiation, or both., The reasons for the wide range of reported prevalence rates of lymphedema are related to lack of standard diagnostic and universal assessment criteria, insidious nature of onset, prolonged clinical course and limited physician knowledge. The over all treatment approach towards breast cancer has changed in the recent past and there is a trend towards less radical surgical procedures. This study was conducted to assess the prevalence and risk factors for development of lymphedema in breast cancer patients treated in the post radical mastectomy era using current treatment protocols. Three hundred breast cancer patients attending the breast cancer clinic of Institute Rotary Cancer Hospital, All India Institute of Medical sciences from December 1998 to March 2000 were included in the study and assessed for the prevalence and risk factors of lymphedema. All patients had treatment prior to 1997. Patients fulfilling the following criteria were included in the study 1) Female breast cancer patients, 2) Early and locally advanced breast cancer patients who had completed loco- regional therapy (surgery with or without radiotherapy) 3) Patients with minimum follow up of one year following completion of loco-regional therapy. Patients with incomplete loco regional treatment, inadequate treatment details and metastatic disease were excluded from the study. Patient's profile with regards to age, menopausal status, body surface area and presence of co-morbid conditions were recorded in a proforma. The details of disease and treatment including type of surgery, radiation therapy and systemic therapy (chemotherapy / hormonal therapy) were also documented. The details of radiotherapy included total dose and extent of irradiation - Chest wall (local) / chest wall and axilla (loco regional). Patients with more than 4 positive nodes or extra nodal disease or inadequate axillary treatment were given axillary radiotherapy. A standard method of lymphedema assessment as described by Markowski et al. and Margaret et al was used in the study. Measurements of the both upper limb circumference were taken at five fixed levels with olecranon process as a reference point (11.5 and 21 cm above and 7.5, 14 and 24 cm below olecranon process). Measurements were taken keeping both the limbs in a similar position with 900 elbow flexion. Difference between two-limb circumferences at any level of more than 3 cm is taken as moderate lymphedema and 5 cm as severe lymphedema. Less than 3 cm difference is considered mild lymphedema. Presence of moderate and severe lymphedema was considered as clinically significant lymphedema in this study. Statistical analysis was carried out using statistical soft ware package (SPSS-9.0) and the statistical significance was calculated using the chi square test. Cox logistic regression analysis was used for multivariate analysis of risk factors. Two hundred ninety nine out of 300 patients were evaluable. One patient was excluded from analysis due to inadequate documentation of treatment details. 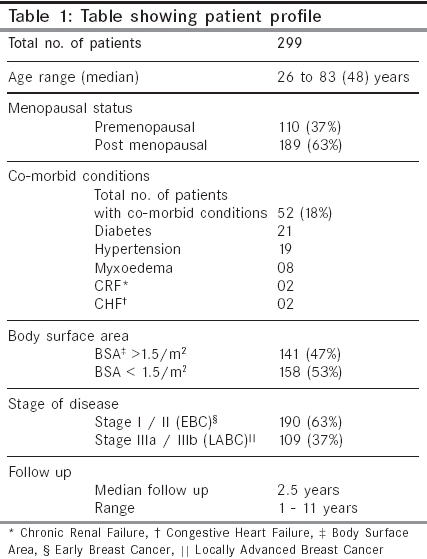 The patient and disease profile are shown in [Table - 1]. The men age was 48 years, 18% of patients had co-morbid conditions and 47% of patients had body surface area more than 1.5 m2. The treatment details are shown in [Table - 2]. The commonest surgical procedure was modified radical mastectomy (89%) and only 12 patients had radical mastectomy. A complete axillary dissection (level-I, II, III) was performed in all the patients. The average nodal yield was 14 (4 - 46) and the men node positivity was 4 (1-36) A total of 202 (67%) patient received postoperative radiotherapy of 50Gy over 5 weeks. One hundred and sixty one (80%) out of these 202 had received both chest wall and axillary irradiation (loco regional) where as the remaining 41 had received only chest wall radiation (local). Two hundred and forty-three patients (81%) received adjuvant chemotherapy and two hundred thirty four patients (78%) received adjuvant hormonal treatment (Tab.tamoxifen-20mg OD). Overall prevalence of clinically significant lymphedema was 33.5% and severe lymphedema was observed in 17.2% of patients. The prevalence of lymphedema was 13.4% in patients treated with surgery only where as the prevalence was 42.4% in patients treated with surgery and radiotherapy. 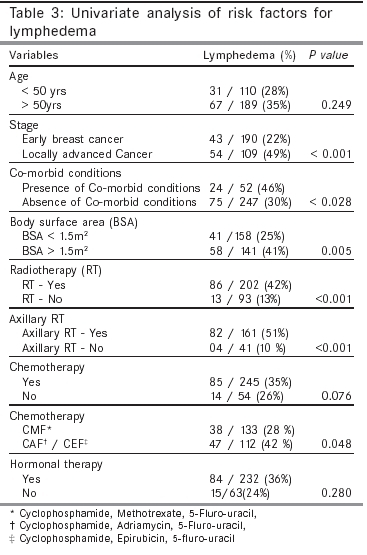 Stage of disease, body surface area, loco regional radiotherapy, presence of co- morbid conditions and anthracycline based chemotherapy have emerged as significant risk factors in univariate analysis [Table - 3] where as axillary radiation and presence of co - morbid conditions have emerged as significant risk factors for lymphedema development in multivariate analysis [Table - 4]. With the transformation of breast cancer into a chronic disease, there is a greater emphasis on quality of life and long-term post treatment sequelae. There is an expectation on the part of patients, their families and caregivers that the patient should lead a near normal life style. One problematic condition for women following breast cancer treatment is lymphedema. Except for breast cancer recurrence, no event is more dreaded than the development of lymphedema. Lymphedema can cause severe physical and psychological morbidity in breast cancer survivors and measurable reduction in quality of life in respect to functional, emotional, physical and social wellbeing., Lymphedema is a progressive pathologic state characterised by chronic inflammatory fibrosis and hypertrophy of the hypodermal and dermal connective tissues due to lymphatic blockage either following surgical trauma or radiotherapy induced fibrosis. Despite refinements in surgical and radiotherapy techniques lymphedema still remains a major late morbidity following successful treatment of breast cancer. The prevalence of upper extremity lymphedema varies from 2% to 40% in women with breast cancer who have been treated with surgery, radiation, or both., This wide variation in prevalence is due to lack of consensus regarding the clinical criteria, method of assessment and timing of assessment for lymphedema. Various methods have been described in literature for assessment of lymphedema including volumetric methods (water displacement) serial circumferential measurement method, MRI, bioelectrical impedance and tonometry. Serial measurement technique, was used in the current study in view of its simplicity and reproducibility. The overall prevalence of clinically significant lymphedema in the current study was 33.5%, however only 17.2% of patients had severe lymphedema. During the era of radical mastectomy the reported incidence of lymphedema varied from 49 to 63%., Subsequently during the modified radical mastectomy era the lymphedema prevalence has shown a decreasing trend and the reported rates of lymphedema following modified radical mastectomy varied from 24 to 28%., Schunemann et al have reported a lymphedema prevalence of 39% following radical mastectomy, 24% following modified radical mastectomy and 9% following breast conservation surgery. The prevalence of lymphedema is also influenced by the extent of axillary dissection. Say et al reported an incidence of 9.1% of lymphedema in patients with simple mastectomy without axillary dissection compared to 31.5% in patients following modified radical mastectomy. Siegel reported that a complete axillary dissection (Level-I, II, III) dramatically increases the incidence of lymphedema as compared to dissection of only Level-I and /or II nodes (37% vs. 8%). However Werner et al reported that the level of axillary node dissection was not statistically related to the development of lymphedema but significant association was seen with obesity. Recently sentinel lymph node biopsy is emerging as an alternative staging procedure for early breast cancer patients to avoid the unnecessary morbidity of axillary dissection in node negative patients. However majority of the breast cancer patients in developing countries still present with locally advanced stage necessitating a comprehensive axillary dissection. In the current series 89% of patients had modified radical mastectomy and the prevalence of lymphedema in this group not receiving radiotherapy was 13.4% only. No definite conclusion could be drawn in relation to the prevalence in radical mastectomy and breast conservation group because of the small sample size. We routinely perform a complete axillary dissection including level I, II, and III clearance and take intra operative precautions in confining the dissection plane along the inferior border of the axillary vein. By adhering to this plane of dissection damage to the major lymphatic trunks of the upper limb can be avoided. Postoperative radiotherapy can aggravate lymphedema by inducing fibrosis, scar formation and radiodermatitis.,, Say et al reported 45% incidence of lymphedema in patients following modified radical mastectomy and postoperative radiotherapy and 31% without radiotherapy. Kissin et al. have reported lymphedema incidence of 8.3 % following radiotherapy alone and 38.3% with a combination of axillary dissection and radiotherapy. Edwards et al studied the incidence of lymphedema after breast cancer treatment by volumetric method and subjective assessment of swelling and found no significant relationship between axillary irradiation and lymphedema. The prevalence of lymphedema in the current study in patients receiving post operative radiotherapy was 42.4% where as only 13.4% of patients not receiving radiotherapy had lymphedema. Sub group analysis revealed a significant correlation between radiotherapy to axilla and lymphedema development. Fifty one percent of patients receiving axillary radiotherapy developed lymphedema in comparison to 10% in patients not receiving axillary radiotherapy. Based on the available literature and results of the current study a combination of surgery and axillary radiotherapy seems to be acting in a synergistic fashion in the causation of lymphedema, resulting in a three to seven fold increase of lymphedema incidence., Where as, when surgery and radiotherapy are used as monotherapy the reported rates of lymphedema are comparable. Hence following axillary dissection radiotherapy to axilla should be used judiciously and unnecessary over treatment of axilla should be avoided. Apart from surgery and radiotherapy various other risk factors for lymphedema development are described in literature including age, presence of co-morbid conditions, wound infection, obesity, stage of disease and systemic therapy.,, Univariate analysis of risk factors in the current study showed a correlation between increased lymphedema rates and advanced stage of disease, presence of co-morbid conditions, body surface area > 1.5 m and postoperative anthracycline based chemotherapy and loco regional radiotherapy. However only axillary irradiation and presence of co-morbid conditions have emerged as significant risk factors for lymphedema development in multivariate analysis. Lymphedema following breast cancer treatment continues to be a significant long-term morbidity in the current era. Approximately one third of breast cancer patients develop clinically significant lymphedema. Postoperative radiotherapy to axilla and presence of co-morbid conditions are significant risk factors for lymphedema development. A combination of axillary dissection and radiotherapy should be avoided when ever feasible. Since there is no ideal treatment available for established lymphedema future efforts should be focussed on optimising treatment combinations, evolving minimally invasive methods like sentinel node biopsy, for staging axilla. 1. Tracy GD, Reeve JS, Fitz S E, Rundle FF. Observation of the swollen arm after radical mastectomy. Aust NZ J Surg 1961;30:204-8. 2. Kissin MW, Querrci DR, Easton D, Westbury G. Risk of lymphedema following the treatment of breast cancer. Br J surg 1986;73:580-4. 3. Hoe AL, Iven D, Royle GT, and Taylor I. Incidence of arm swelling following axillary clearance for breast cancer. Br J surg 1992;79: 261-2. 4. Pain SJ, Purushotham AD. Lymphedema following surgery for breast cancer. Br J Surg 2000; 87:1128-41. 5. Logan V. Incidence and prevalence of lymphedema: A literature review. J Clin Nurs 1995;4:213-9. 6. Ozalslan C, Kuru B. Lymphedema after treatment of breast cancer. Am J Surg 2004;187:69-72. 7. Markowski J, Wilcox JP, Helm PA. Lymphedema incidence after specific post-mastectomy therapy. Arch phys Med Rehab 1981;62:449-52. 8. Margaret LF. Lymphedema. In: Berger AM, Portenoy RK, Weiss man DE, editors. Principles and practice of supportive oncology. New york: Lippinctt-Raven; 1998. pp. 275-89. 9. Beaulac SM, McNair LA, Scott TE, LaMorte WW, Kavanah MT. Lymphedema and quality of life in survivors of early- stage breast cancer. Arch Surg 2002;137:1253-7. 10. Johansson K, Holmostrom H, Nilsson I, Ingvar C, Albertsson M, Ekdahl C. Breast cancer patients' experiences of lymphedema. Scan J Caring Sci 2003;17:35-42. 11. Britton RE, Nelson PA. Causes and treatment of post mastectomy lymphedema of arm - report of 114 cases. JAMA 1962;180: 95-102. 12. Huges JH, Patel AR. Swelling of the arm following radical mastectomy. Br J Surg 1966;53:4-14. 13. Schunemann H, Willich N. Lymphedema of the arm after primary treatment of breast cancer. Anti Cancer Res 1998;18:2235-6. 14. Mortiner PS, Bates DO, Brassington HD, Stanton AWB. The prevalence of arm oedema following treatment for breast cancer. QJ Med 1996;89:377-80. 15. Say CC, Donegen W. A biostatistical evaluation of complications from mastectomy. Surg Gynaecol Obstet 1974;138:370-6. 16. Siegel BM, Kathleen A, Love SM. Level I, II axillary dissection in the treatment of early stage breast cancer. Arch Surg 1978;125: 1144-7. 17. Werner RS, McCormick B, Petrek J, Cox L, Cirrincione C, Gray JR, et al. Arm oedema in conservatively managed breast cancer: obesity is a more predictive factor. Radiology 1991;180: 177-84. 18. Edwards TL. Prevalence and aetiology of lymphedema after breast cancer treatment in Southern Tasmania. Aust NJ Surg 2000;70: 412-8. 19. Ryttov N, Holm NV, Quist N, Blichert. 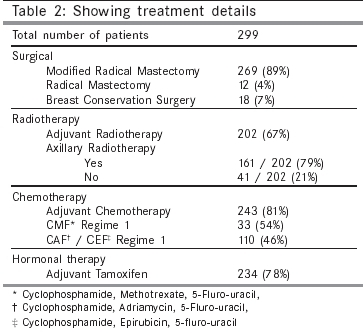 Influence of adjuvant radiotherapy on the development of late arm lymphedema and impaired shoulder mobility after mastectomy for carcinoma of breast. Acta Oncol 1988;27:667-8. 20. Segerstorm K, Bjerle P, Graffman S, Nystrom A. Factors that influence the incidence of brachial oedema after treatment of breast cancer. Scand J Plast Reconstr Surg Hand Surg 1992;26: 223-37. 21. Cox CE, Pendas S, Cox JM, Joseph E, Shons AR, Yeatman T, et al. Guidelines for sentinel node biopsy and lymphatic mapping of patients with breast cancer. Ann Surg 1998;227:645-53. 22. Golshan M, Martin WJ, Dowlatshahi K. Sentinel lymph node biopsy lowers the rate of lymphedema when compared with standard axillary lymph node dissection. Am Surg 2003;69:209-11. DiSipio, T. and Rye, S. and Newman, B. and Hayes, S.
Paiva, D.M.F. and Rodrigues, V.O. and Cesca, M.G. and Palma, P.V. and Leite, I.C.G. Hemmati, S. and Jabbari, H. and Akbari, M. and Tajvidi, M. and Adeli Rankoohi, P.
Balci, F.L. and DeGore, L. and Soran, A.
Gurdal, S.O. and Kostanoglu, A. and Cavdar, I. and Ozbas, A. and Cabioglu, N. and Ozcinar, B. and Igci, A. and Muslumanoglu, M. and Ozmen, V.
Bevilacqua, J.L.B. and Kattan, M.W. and Changhong, Y. and Koifman, S. and Mattos, I.E. and Koifman, R.J. and Bergmann, A.
Feldman, J.L. and Stout, N.L. and Wanchai, A. and Stewart, B.R. and Cormier, J.N. and Armer, J.M. Wanchai, A. and Stewart, B.R. and Armer, J.M. Ahmed, R.L. and Schmitz, K.H. and Prizment, A.E. and Folsom, A.R. Shah, C. and Vicini, F.A. Randheer, S. and Kadambari, D. and Srinivasan, K. and Bhuvaneswari, V. and Bhanumathy, M. and Salaja, R.
Nascimben Matheus, C. and Caldeira De Oliveira Guirro, E.
Smoot, B.J., Wong, J.F., Dodd, M.J.
15 Lymphedema following cancer therapy in Slovenia: A frequently overlooked condition? Rucigaj, T.P., Leskovec, N.K., Zunter, V.T. Pillai, P.R. and Sharma, S. and Ahmed, S.Z. and Vijaykumar, D.K. Smoot, B., Wampler, M., Topp, K.S. Tsai, R.J., Dennis, L.K., Lynch, C.F., Snetselaar, L.G., Zamba, G.K.D., Scott-Conner, C.
Stanton, A.W.B., Modi, S., Mellor, R.H., Levick, J.R., Mortimer, P.S. Lawenda, B.D., Mondry, T.E., Johnstone, P.A.S. Meeske, K.A., Sullivan-Halley, J., Smith, A.W., McTiernan, A., Baumgartner, K.B., Harlan, L.C., Bernstein, L.
24 Management of patients with breast cancer: Are we ready in India for sentinel lymph node biopsy? Deo, S.V.S., Varma, M.C., Shukla, N.K. Irdesel, J., Kahraman Çeliktaş, S.
Irdesel, J. and Kahraman Ã‡eliktaÅŸ, S.
Purushotham, A.D., Britton, T.M.B., Klevesath, M.B., Chou, P., Agbaje, O.F., Duffy, S.W. Paskett, E.D., Naughton, M.J.,McCoy, T.P., Case, L.D., Abbott, J.M. Neuhüttler, S., Kröll, A., Brenner, E.